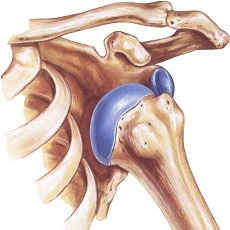 Your shoulder joint is made up of three bones: your collarbone, your shoulder blade, and your upper arm bone. The top of your upper arm bone is shaped like a ball. This ball fits into a cuplike socket in your shoulder blade. A shoulder dislocation is an injury that happens when the ball pops out of your socket. A dislocation may be partial, where the ball is only partially out of the socket. It can also be a full dislocation, where the ball is completely out of the socket. What causes a dislocated shoulder? Your shoulders are the most movable joints in your body. They are also the most commonly dislocated joints. A dislocated shoulder can happen to anyone, but they are more common in young men, who are more often involved in sports and other physical activities. Elderly people, especially women, are also at higher risk because they are more likely to fall. If you are having these symptoms, get medical treatment right away. To make a diagnosis, your health care provider will take a medical history and examine your shoulder. Your provider may also ask you to get an x-ray to confirm the diagnosis. The first step is a closed reduction, a procedure in which your health care provider puts the ball of your upper arm back into the socket. You may first get medicine to relieve the pain and relax your shoulder muscles. Once the joint is back in place, the severe pain should end. The second step is wearing a sling or other device to keep your shoulder in place. You will wear it for a few days to several weeks. The third step is rehabilitation, once the pain and swelling have improved. You will do exercises to improve your range of motion and strengthen your muscles. You may need surgery if you injure the tissues or nerves around the shoulder or if you get repeated dislocations. A dislocation can make your shoulder unstable. When that happens, it takes less force to dislocate it. This means that there is a higher risk of it happening again. Your health care provider may ask you to continue doing some exercises to prevent another dislocation.